I asked “Azim Sahib, where did you get your early education?” He told me “Initially, I attended Metropolitan School and later Government Boys Secondary School Kotwal Building. The standards of Government Schools those days were very good. I was lucky to have very able and dedicated teachers. When I look back, I always remember them and that how much I owe to my parents and my teachers. By the grace of God, I was not only academically a good student but also took active part in extracurricular activities. I was Vice Captain of the School Hockey team. I took part in inter-school debates and won a lot of prizes for the school. I was the school Magazine Editor and General Secretary of the students union. I secured first division and fifth position in the Karachi Matriculation Examination. “What about your Secondary Education?” Dr .Azim was quite, for a while, then added by saying.” I wanted to acquire technical education as I was always fascinated by the role of technology in the development of human civilization. I secured admission in DJ Government Science College. It was one of the best educational institutions in Karachi. At DJ Science College, I again took active part in sports and debates. I represented the college in all Pakistan inter collegiate debates. I was elected the General Secretary of Karachi Speakers Forum. 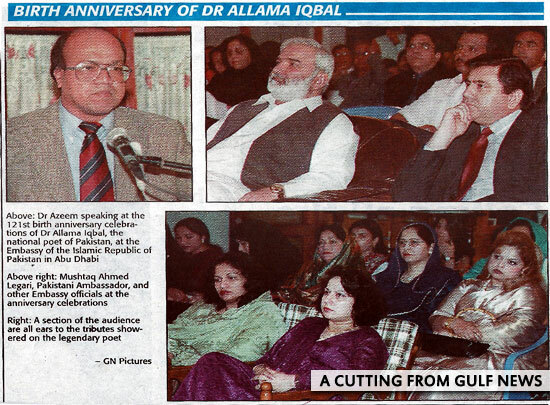 Those days a lot of efforts were made to prepare the speeches and this resulted in excellent intellectual development. It was during those days that I began my interest in poetry and literature. Poetry of Ghalib, Iqbal and Faiz fascinated me and awakened the poet in me. Bertrand Russell, Ibn Khaldun, Leo Tolstoy, Oscar Wilde, Ernest Hemingway, were my favorite writers. I secured first division and second position in Intermediate exams in Karachi. I asked Dr. Azim “What about you’re engineering studies?” He left me for a while to welcome his guests but came back after a while and continued where he left off “I joined, NED Government Engineering College. 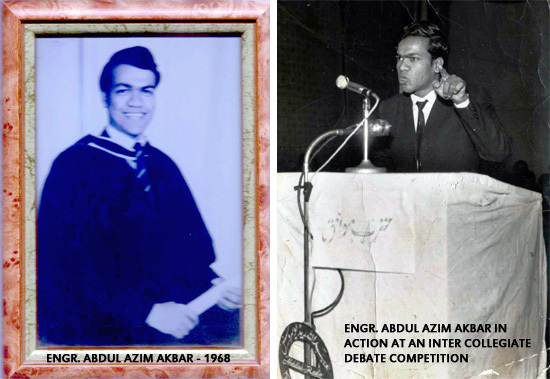 I continued to take part in All Pakistan inter collegiate debates and won many trophies and prizes for my college. Due to good academic results, I was awarded scholarship by Volkart Education Foundation Switzerland for post graduate studies in Europe, I was able to secure admission at Imperial College, London. As soon as results of my final year engineering at NED College were announced I flew to London in October 1968 and joined Imperial College. At Imperial College, I secured the post graduate diploma (DIC), MSc and PhD in Thermal Power and Process Engineering. Studying and doing research at Imperial College was a great experience where I not only had the opportunity to learn from the world renowned and eminent professors in the engineering field but also to meet and work with brilliant students from different countries. I learnt a lot from English society. I found tolerance, rationality, logic, coolness as the hallmarks of English society. The governance was excellent with a lot of emphasis on social welfare such as free health service, free school education, unemployment benefits, provision of housing to poor families etc. I would dream that similar social welfare system would one day be implemented in my country so that people with low income will not suffer. I was invited to take part in BBC Urdu service programs which was another great experience. After completing my PhD, I was offered teaching job along with Post Doctorate research at the UMIST (University of Manchester Institute of Science and Technology).” What about your family life? 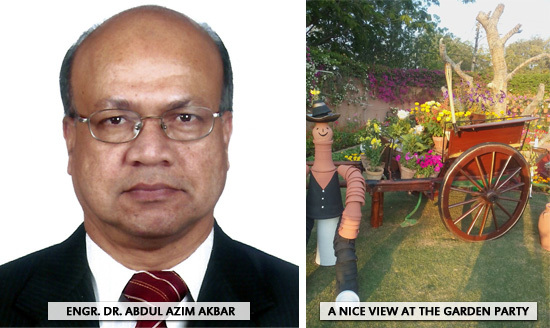 Dr. Azim after a long pause, closely looking at the flowers, said, “I got married in 1975, she had studied Home Economics. We have two sons and one daughter, highly qualified, Alhamdulillah from some of top rated foreign Universities.” Engr Azim, please tell me something about your career? I asked. He replied “I accepted the offer from the University of Manchester Institute of Science and Technology as I always thought that teaching was a very noble job. I later joined M/s Parsons in their London office and worked on mega projects for Shell, Monsanto and NIOC. I was then offered a job at the Abu Dhabi National Oil Company (ADNOC) which I accepted mainly because it would be close to Pakistan and that my children would be able to grow in an Eastern and Islamic Environment. This was the beginning of a long and great association which lasted for 35 years during which time I worked in various senior positions including as an Advisor. ADNOC at that time was only a small oil exploring, producing and exporting Company but as it had large oil and gas reserves and oil prices were rising, Abu Dhabi thought that it was a great opportunity to not only increase its oil production and exports but also to develop the gas production and downstream oil refining, gas processing and petrochemicals industry to add value to its natural resources. This was very ambitious and challenging mission as all facilities required for the industry were also needed to be developed from scratch. It involved development of a vision, master plan, infrastructure, human resources, business strategy, corporate governance, systems and procedures followed by management of mega projects, development of joint ventures, operation of plants, development of markets etc. I was involved in all these activities and it was not only challenging and enjoyable but it gave me a great experience in all aspects of Oil, Gas and Petrochemical Business. All was successfully achieved and today ADNOC has grown into one of world biggest Oil, Gas and Petrochemicals Conglomerate. I am proud to have taken part in and contributed to one of fastest and successful development in the history of the world. During my long stint with ADNOC, I also had to travel and stay in different countries of the world such as USA, UK, China, South Korea, Italy, Switzerland etc. which was again a great education and experience for me.